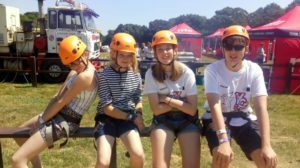 On the last weekend of June, 8 young people and two youth workers from The Zone Youth Club attended the national Young Carers Festival at the YMCA Fairthorne Manor in Hampshire. The festival, run by The Children’s Society, gives young carers the opportunity to relax, socialise and have their voices heard about issues that affect them. The outcomes from the consultations inform future work and are also communicated to the government. We would like to say thank you to everyone who supported our fundraising at the Independent Market and Bunnings, making it possible for us to take the group on this amazing opportunity. The Zone Youth Club, run by The Pod Charity, benefits young carers aged 10-18 and aims to be a fun, relaxed place to unwind. We meet every other Wednesday from 6-8pm, many of our members have a sibling with a disability. Activities are driven by our youth members and have included film, cooking and challenge nights. Our youth work team provide a nurturing environment, whilst supervising and supporting the activity choices. If you know someone who may benefit from joining The Zone, please email info@thepodcharity.org.uk or contact Jane on 07736 470328. The Zone is reliant on grants, donations and our own fundraising activities and is seeking funding to maintain services. If you feel like you could offer support or would like to get involved, we would love to hear from you. Previous Previous post: The Pod celebrates 5 years!